For more than 50% of the puppies and dogs at Hinsdale Humane Society (HHS), it is a long journey to find their forever homes. Approximately half of the dogs HHS receives are the result of a lifesaving “transport” program where they are rescued from overcrowded, high kill, poorly funded animal control facilities in southern Illinois, Iowa, and Missouri. Transport groups, run entirely by volunteers, act as the conduit for animals in peril, driving them countless miles to safe havens like Hinsdale Humane Society. The mission of these life-saving transfer groups is to save the lives of adoptable, but vulnerable dogs and cats that are potential candidates for euthanasia in facilities that typically have few local adoptions. In some animal control facilities, owner-surrenders may be euthanized on their day of arrival due to lack of kennel availability. Transport groups send email pleas to locate shelters or rescue groups who will accept the animals. They provide whatever information is available about the animals needing homes and also arrange for transport to the intake organizations. 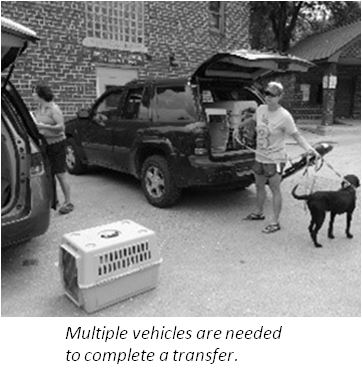 Jenny Vlazny, HHS Operations Manager, reviews the information and selects the animals for transfer. Accompanying photos are a significant piece of the process for Vlazny. Her nearly 30 years of experience working with animals enables her to make an initial assessment of adoptability based in part on facial expression and body language. “I try to choose a variety of breeds, sizes and ages that will appeal to different adopters,” says Vlazny. She is also willing to take in those animals that may be less desirable to other organizations because they are older or need foster care, or require temporary medical attention for a curable condition such as heartworm disease. As Vlazny explains, “HHS has many resources…we are able to save lives because of our generous donors, well-trained staff and caring volunteers, an established foster care program, and outstanding veterinarian partnerships.” The final selection is always difficult, though, especially when desirable, adoptable animals can’t be accommodated due to limited kennel space at HHS. A typical transport group relocates 20-30 animals, (primarily puppies and dogs) every week, sometimes traveling more than 300 miles. 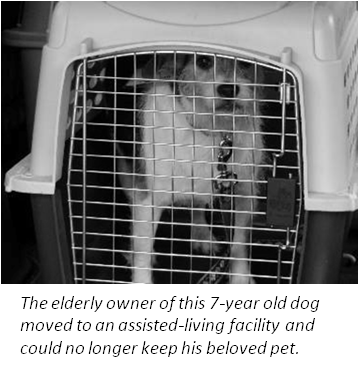 Crated dogs are transferred from one volunteer to another to complete the transport to waiting volunteers that bring them to their final destinations. On transport day, several cars/vans filled with crates of animals arrive at HHS. Some animals have reached their final destination; others continue on to other intake shelters and rescues in the area. A typical transport brings 8-10 puppies/dogs to HHS (although there have been as many as 19 arrivals!). After more than 5 hours of travel, the puppies/dogs are welcomed by HHS staff members and exit their transport crates one by one. As the parade begins with HHS staff bringing carriers with puppies and walking dogs on leashes into the shelter, there is the realization that all of these animals now have a second chance, a new chapter in their lives, and an opportunity to find a loving, forever home. At the shelter, transport dogs, just like every animal that arrives at HHS, are cared for in quiet, secluded kennels for 48 hours as they acclimate to new surroundings. After this period, each one is examined by a trained staff member, receives necessary shots, medical testing, preventative healthcare, and is microchipped. 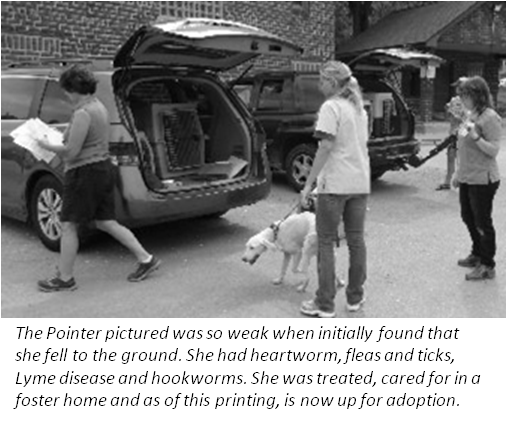 In addition, each animal is behavior evaluated to provide additional information that the staff shares with potential adopters. When the puppy/dog is ready, it is moved to an adoption kennel with food, water, toys, a bed or blanket, and loads of attention and love from staff and volunteers. For an individual or family looking for a furry family member, the moment that eyes meet, smiles appear, and a tail wags is unforgettable. The adoption process begins and in a very short time, the homeless puppy/dog, young or old, big or little, is going to its forever home, and another life has been saved!